This summer I made a conscious effort to focus on filling my life with positivity: positive thinking, positive people, and positive actions. I think I did a pretty successful job, but it's been a bit harder in college. While I absolutely love being back I often times find myself surrounded with negativity. I get that school comes with challenges and difficulties, but I find that any negative situation can be turned around and viewed in a positive way. And often times viewing it in a positive way is a much better way to go about it. As a result, I've struggled a bit with discovering how to live a positive life in college. 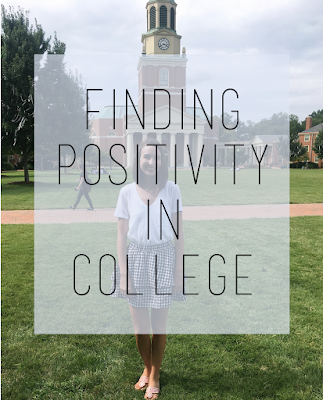 I thought it would be helpful if I shared some of the things that have been helpful in me finding positivity in college. 1. Say No: If you do not want to be around someone because they are full of negativity than just simply say no. You don't have to spend time around anyone you don't want to. That seems like a given but sometimes you feel like to be social in college you always have to be saying yes but don't be afraid to say no sometimes. A night spent alone is better than a night spent with someone who drains you. 2. Take Time Away: Sometimes school will simply become a stress bubble full of negativity and self-doubt. On those days take some time for yourself away from campus. Go get your nails done, walk around the mall, or study in that coffee shop downtown. Simply removing yourself can help you recharge. 3. Write Down 3 Positive Things a Day: I found this to be one of the most helpful things for simply reminding yourself of all the good. Take a few minutes at the end of your day and write down what you loved about the day. Not only is it a refreshing way to end the day but it is the perfect thing to look back on after a rough day to remind yourself that things will be okay. 4. Say Yes to What Makes you Happy: Don't feel that you have to do anything. If you want to sit in your room and watch Netflix one night then do it. Find your positivity and light. Usually, when you are full of happiness, you will be more positive. So don't be afraid to take time for yourself, sometimes it really is the best in the long run. 5. Find a Way to Manage your Stressors: Most things that will stress you are things that you can't exactly get rid of, so the best thing is to learn how to manage them. If school begins to cause you stress than find a way to better plan ahead. If your job gives you stress than find a way to better fit it into your schedule. Finding a way to deal with your stress will definitely help eliminate negativity. I hope this was helpful for some of you. I truly believe that a positive attitude is the key to a fun and successful college career. But finding that positivity, is definitely something that I have been personally struggling with this semester so if you have any tips as well I would absolutely love to hear them!